CS provided 270 metres of 200W crashrail and more than 60 full height, heavy duty rubber corner guards. 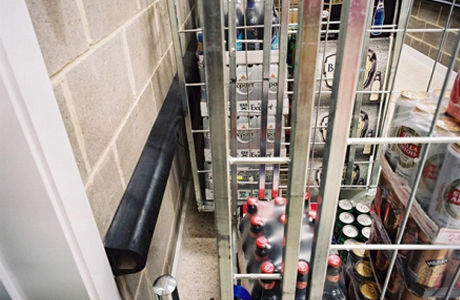 Installed across 3 back-of-house levels by CS’ in-house installation team, Conspec Contracts, the Acrovyn rubber protection package ensures that back-of-house areas can stay low maintenance for years to come. Opened in 1976, Guildhall Shopping Centre in Exeter has recently undergone a £17 million refurbishment and extension; its first since opening its doors all those years ago. The planned improvements, led by owners Aviva Investors, included significant changes to the Guildhall’s public areas, its High Street entrance, and the Higher Market section. With the new investment, the owners wanted to attract top quality brands and restaurant businesses to their centre, offering local residents a best-in-class retail and leisure destination. Architects BDP, along with property consultants GL Hearn, and Cushman & Wakefield, were tasked with re-designing the centre in a way that pays homage to its heritage, whilst also meeting Aviva Investors’ aspirations. But with additional store lettings and more retailers, comes the challenge of increased pressure on back-of-house areas, more stock deliveries moving through corridors, and potentially higher maintenance costs due to damaged walls. To ensure the back-of-house areas stayed operational and required minimal maintenance, BDP chose CS Acrovyn Rubber wall protection. Designed with excellent shock-absorbing qualities, they are the ideal solution for busy service corridors liable to damage from trolleys, carts and more. Wall damage, and the potential for service corridor areas to be out of commission due to repairs, was a concern for us. CS provided 270 metres of 200W crashrail – severe duty EPDM rubber rails capable of withstanding the toughest knocks. Each service corridor required different levels of protection, so CS supplied the 200W crashrail in two thicknesses, and in some areas installed the rail at two heights – mid-level and low-level – for extra protection. To protect vulnerable external corners throughout the corridors and lift areas, CS supplied more than 60 full height, heavy duty rubber corner guards. Installed across 3 back-of-house levels by CS’ in-house installation team, Conspec Contracts, the Acrovyn rubber protection package ensures that back-of-house areas can stay low maintenance for years to come. I feel confident knowing that our back-of-house areas are no longer vulnerable to damage, and that our maintenance budget can be allocated to other areas of the shopping centre.